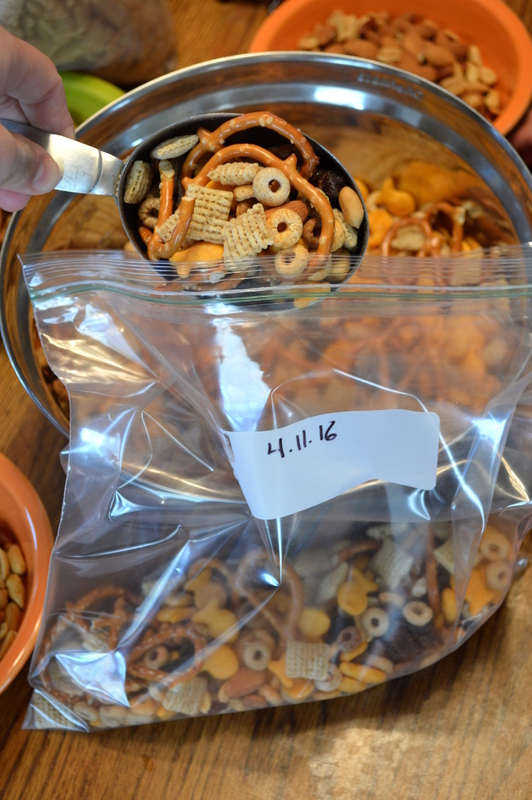 A friend of mine makes her own snack mix and I thought that was such a great idea to do. So I started making my own as well. Over the years it has changed, especially since my little one has been eating it too. What I love about making my own is I can change it up so I don't get bored and I get to choose what I put in it. 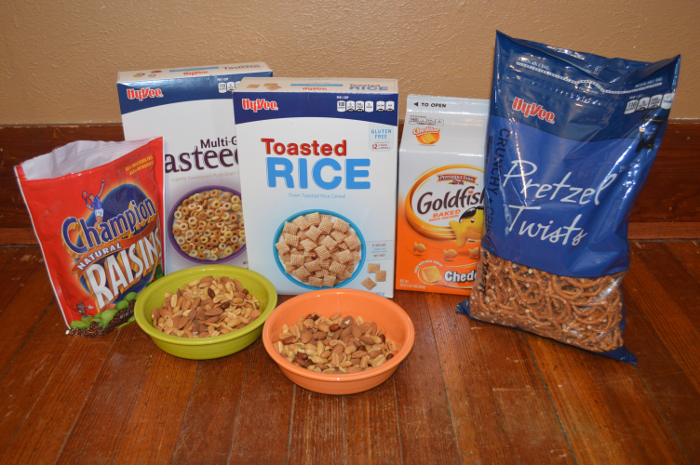 Plus I can stock up on the ingrediants when they go on sale and it can be more afordable than buying snack mix. I recently just threw in the rasins and I really like them. 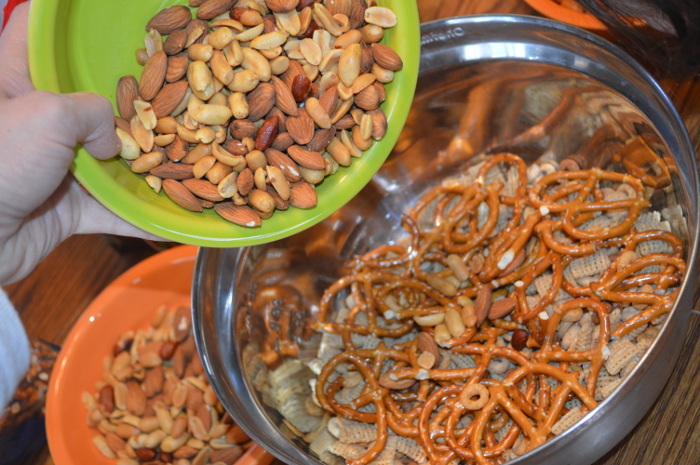 For a cheaper recipe you can swap sunflower seeds for the peanuts. Then the rest you can differ as you please. Cheese Its (I originally used these until the little was born, then I switched to goldfish). 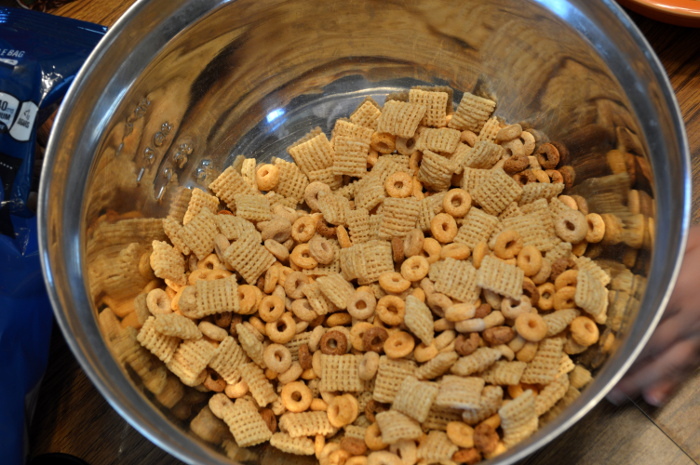 Honey Chex or any of the other many flavors. Again you can make it how ever you like! Not a fan of cereal, leave it out. There are so many options! 1. 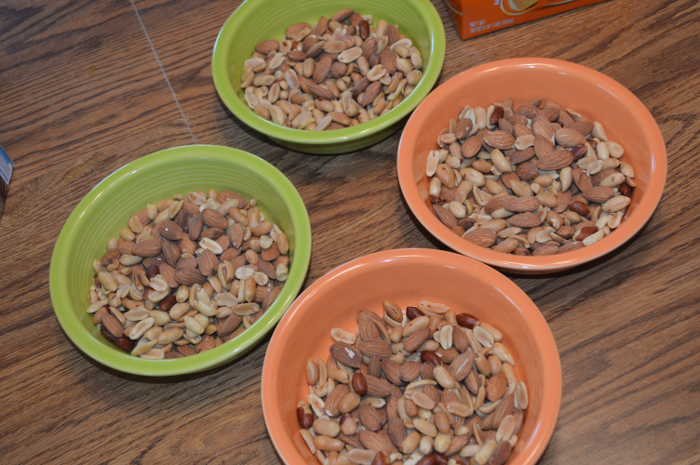 I separate the nuts and/or sunflower seeds into 4 bowls. It just makes it easier to divide later. 2. 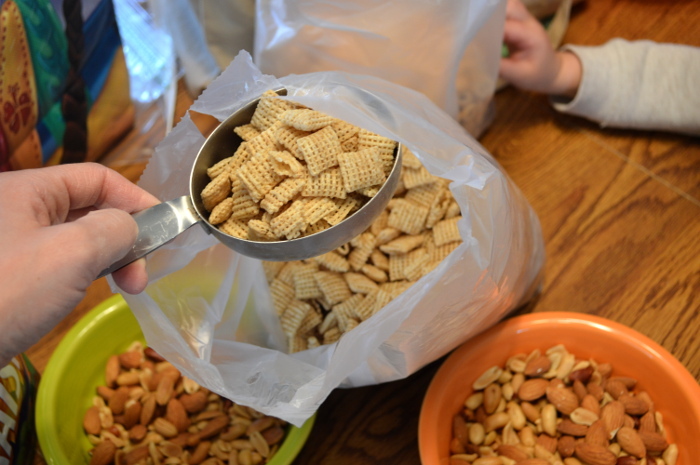 Scoop cereal into a large bowl. I do about 2-2 1/2 cups of each cereal. The bowl I use can hold up to 4 quarts or 16 cups and I usually fill it almost entirely. 3. Add pretzels. I just add a few handfuls. 5. Add goldfish. With this being the last thing I add, I just add until the bowl is pretty full. 6. Mix together. 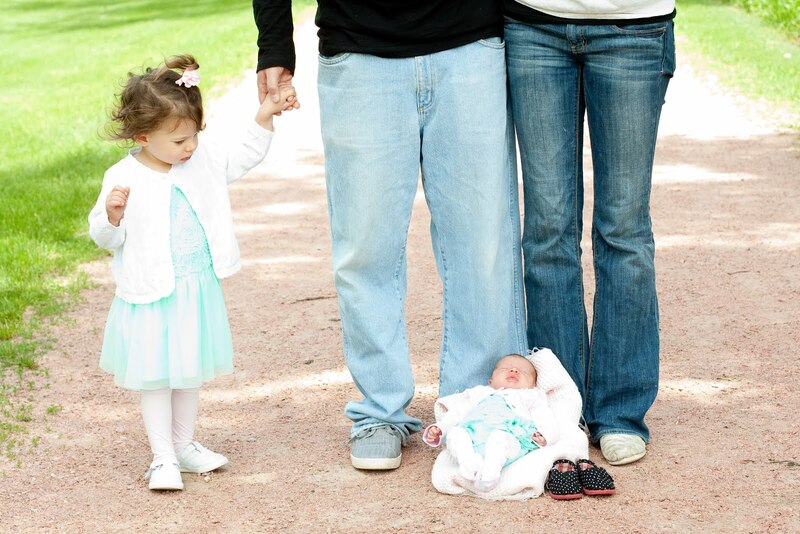 Little helpers are always helpful! 7. Scoop into a gallon sized freezer bag. My 1st bag always has the least amount so as I go, I add more to it. The best part about this mix is it doesn't have to be exact, just mixed up enough for variety. 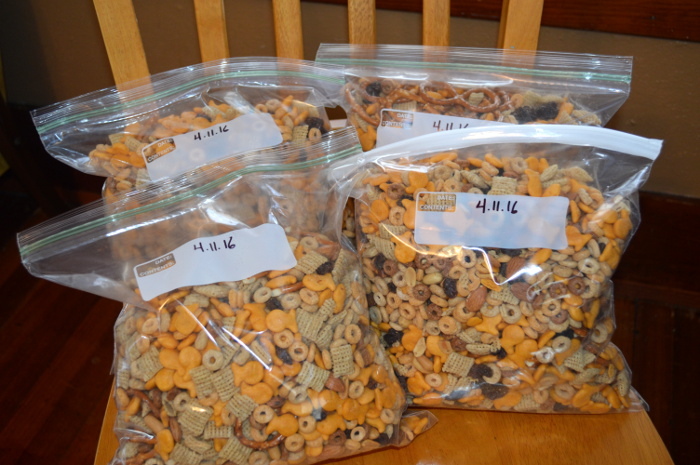 Now, I do wait until the different items are on sale and then buy them in bulk to make a large amount of the snack mix. The recipe above will make about 4 gallon sized bags and I freeze what I won't eat right away. 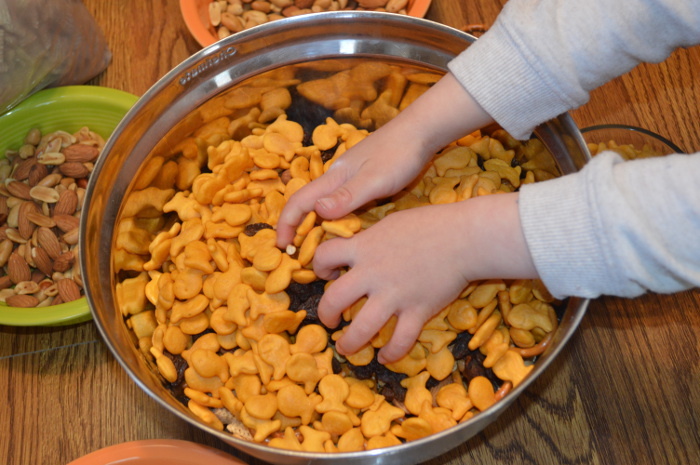 The best part about this mix is it's healthier than most snacks and so it's great for your kiddos to snack on. Plus its better than just eating Cheeze-Its until the box is empty, yep I have done that.